All customs change. Some of the modern customary practices of Newfoundland and Labrador are of great antiquity while others are fairly recent in origin. Traditional customs of our communities reflect the past, but they also respond to the present. No folklore ever survives a new generation unless someone in the new generation finds it relevant to his/her life. What may be a religious practice for one generation may be entertainment for the next, a fund-raiser for another, an educational event for someone else, and so on. That customs change relevance and evolve is as true today as in every other period in our history. After many generations, a custom may reflect the different eras, each in small ways. When people think of customs in this province, the first that springs to mind is Christmas mummering. It has received a lot of attention in the past thirty years and although it was in decline in the middle part of this century, it received a boost in popularity in the 1980s and '90s. Mummering is an example of what folklorists call calendar customs, practices tied to certain dates or seasons. Calendar customs contrast with life cycle customs, also known as rites of passage. Life cycle customs often vary a great deal from one ethnic or religious group to another even within the same geographic area. Over four hundred names for customs have been identified in Newfoundland and Labrador. Many of these are local terms in different places for the same or similar customs: the four hundred names represent about 150 different customs. Some calendar customs are shared by people throughout Newfoundland and Labrador. Old Christmas Day, Candlemas Day, Pancake Night, Mid-Summer's Day, Orangemen's Day, All Soul's Day and Christmas Day are all known widely and to some extent share their local activities and beliefs throughout the province. Other dates are known or celebrated only in certain local areas; some customs are celebrated in entirely local ways. Coombses' Day (February 3rd) is known only in the Upper Island Cove area of Conception Bay. It commemorates a day almost two centuries ago when several members of the Coombs family died tragically in a snow storm. Candlemas Day (February 2nd) is known as "La fête de la chandeleur" among the francophones of the West Coast and is celebrated with a beribboned bachelor King visiting houses of eligible young women. Elsewhere in the province it is known as a day to watch for bears' shadows in order to predict the weather. Candlemas Day is the same date as the American Groundhog Day but retains the old Christian calendar name, which derives from the tradition of blessing the annual supply of church candles on that day, the official end of the liturgical Christmas season. In older European traditions, bears step outside their hibernation caves to check the weather on February 2nd. If it is fine they will stay out for the remainder of the season. In Newfoundland this belief has remained more or less intact in the rhyme "If Candlemas Day be clear and fine, the rest of winter is left behind; If Candlemas Day be rough and grum, there's more of winter left to come" (cf. Hiscock 1996:35). Pancake Night, or Shrove Tuesday, is typical of Newfoundland calendar customs. Derived from widespread customs in European traditions, and shaped as much by religious beliefs as by traditional divinational activities, it is a mixture of traditions, evolving continuously. Shrove Tuesday (named for the religious practice of confessing one's sins and being "shriven" or "shrove" by the priest immediately before Lent began) was a time to use up as many as possible of the foods banned during Lent: meat products in particular, including butter and eggs. Pancakes were a simple way to use these foods, and one that could entertain the family. Objects with symbolic value are cooked in the pancakes, and those who eat them, especially children, take part in a divinatory game as part of the meal. The person who receives each item interprets the gift according to the tradition: a coin means the person finding it will be rich; a pencil stub means he/she will be a teacher; a holy medal means they will join a religious order; a nail that they will be (or marry) a carpenter, and so on (cf. Hiscock 1990:9). Midsummer's Day can be traced back to European traditions before the advent of Christianity. One of its modern forms is St John's Day, a thoroughly Christianized name. Now merely a municipal holiday in St John's, it was formerly called Discovery Day, one of the national holidays of Newfoundland. Its roots go back through the bonfire celebrations that are still made on the Southern Shore of the Avalon Peninsula (as well as some other predominantly Irish-settled communities in Conception Bay). These fire customs are as old as, or even older than, the Guy Fawkes Night bonfires in early November. In the 1940s the Newfoundland Government instituted a holiday on June 24th to celebrate Newfoundland's history. The day was removed from the calendar by the provincial government in the late-1980s. Memorial Day conflicts with the celebration of Canada Day. It was established soon after the tragically destructive events of July 1st 1916, the opening day of the Battle of the Somme, when hundreds of Newfoundland soldiers lost their lives at the battle of Beaumont-Hamel. Each year since, commemorative parades and memorial services have been held to honor the fallen. Orangemen's Day, July 12th, commemorates the day in July 1690 when the forces of constitutionalism won out over the forces of anti-Parliamentarianism at the River Boyne in Ireland: King William of Orange, the Protestant King of England defeated former King James, a Catholic. The Orange Order was established a century after the Battle of the Boyne and steadily grew in the 19th century as a patriotic bulwark against what many Protestants saw as treasonous Catholicism. By the end of the 19th century Orangemen's parades were commonplace in many Newfoundland communities. The parade was one part of a series of events through the day, culminating in a public dinner and dance (often called a "Time"). However popular Orangemen's Day has been, on the northeast coast mid-July is at the peak of the inshore cod-fishery. A single day parading and dancing might mean a loss of ten percent of a fisherman's annual income. Thus many communities moved their Orange celebrations to the Christmas season, when no work was necessary. Thus we find Orangemen's Times on St. Stephen's Day (December 26th) and New Year's Day, as well as other dates (cf. Hiscock 1997:129-134; 317-318). Throughout Newfoundland, churches have held Garden Parties to raise funds for local parishes or for special projects. On some designated day, usually a Sunday when fewer people would be working, a day-long party is held outdoors, if the weather is fine, or in the church hall, if not. With wheels of fortune, and races in the afternoon, meals served at suppertime, and a dance at night, the festivities would continue for hours. In recent years the organization of such community-wide parties has frequently devolved to town councils, and a weekday often in early August has been set aside. 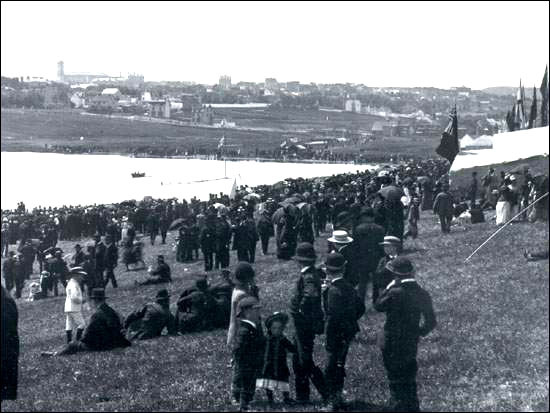 In some larger towns the garden party became a regatta - Harbour Grace, Placentia and St John's are three examples. The St John's Regatta is the largest of these garden-parties-become-regattas; on the first Wednesday in August (or the first fine day thereafter), the city stops working and attends the boating races on Quidi Vidi Lake. Upwards of 30,000 attend every year, with estimates in some years of over 50,000 people attending the day-long event. View of the crowd and tents at Quidi Vidi Lake during the annual St. John's Regatta. Courtesy of Archives and Special Collections (Coll - 137, 6.01.007), Queen Elizabeth II Library, Memorial University of Newfoundland, St. John's, NL. Many of the autumn season's customs are historically related. Today's Thanksgiving Day holiday is one such date. Although there was no government-mandated Thanksgiving Day holiday in Newfoundland at Confederation in 1949, many local groups celebrated it as part of the fall season of Hallowe'en. It took the form of Harvest celebrations, a little like the garden parties of high summer. The whole season of Hallowe'en is of interest to folklorists. In this province, a half-dozen Hallowe'en-related customs have been reported and described, with dozens of names. The few days before Hallowe'en and sometimes after it are called Mischief Week (or Mischief Night if it falls locally on a single date). Children have traditionally believed that there are certain kinds of mischief allowed at that time: stuffing sods in chimneys, soaping windows, taking pins from gate hinges, and so on. When combined with the local bonfire traditions, it might even include stealing old tires, fences and boats to make the bonfire bigger. Fire traditions are generally popular in the province at this time of year: Torch Night is a name given to a date near Hallowe'en in Trinity Bay North: young men would carry torches around the community in a parade. In Old Perlican this was last seen about seventy years ago. Torches might be made from old boots soaked in fish oil, or half-barrels filled with kindling and oil, or old dried-up tar mops; in fact the name Tar Mop Night was used in the White Bay area. In many communities, the custom of torchlight parades died out around the same time as electricity came to the area. Bonfires on November 5th in commemoration of the death of the anti-Parliamentary terrorist Guy Fawkes are still carried out every year in hundreds of communities around the province. Most present-day participants in the fires would be hard-pressed to say who Guy Fawkes was, and the custom mainly functions to help clean up communities (cf. Schwoeffermann 1981a and b). The Christmas season begins on different dates, depending on local traditions. On the South Coast of the island of Newfoundland, the season's first "official" day is Tipp's Eve, a name assigned to December 23rd. Sometimes known as Tipsy Eve, it is popularly (though unhistorically) interpreted to mean the day one can get "tipsy" -- the day one starts drinking Christmas cheer. On the North Coast of Labrador the season begins, like the liturgical season of Christmas, on Advent Sunday, in late November or early December (Cf. Edmund n.d.). This stems from Moravian traditions parallelling European celebration of St Nicholas's Day (December 6th), the day on which children were given gifts. In most of North America that aspect has shifted to Christmas Day, but the older practice is still carried on in the Labradorian traditions of children hanging Advent stockings and decorating small Advent Trees in their bedrooms. The tradition of giving gifts at Christmas springs not only from the celebration of the day of the patron saint of children, St Nicholas, but also from medieval traditions of gift-giving at New Year's. In some Newfoundland communities the New Year's Eve tradition of putting out stockings and receiving small gifts to celebrate the New Year continued until just a generation or two ago. The season of Christmas is often said to be twelve days long, and ends for most people on "Old Christmas Day," January 6th. This date is liturgically the Feast of the Epiphany and signals the beginning of the third part of the church's Christmas season (Advent, Christmas proper and Epiphany). The comparatively recent name "Old Christmas" stems from the 1752 reorganization of the calendar when twelve days were dropped from the calendar; the following year, purists said that the "real" Christmas Day was not on December 25th, but January 6th, 365 days after the previous Christmas. The knowledge of the Old Style has led some Newfoundlanders to name "Old Old Christmas Day" (January 18th) as the "real" end of the season. Indeed mummering can sometimes be seen on the Southern Shore of the Avalon peninsula until the end of January. 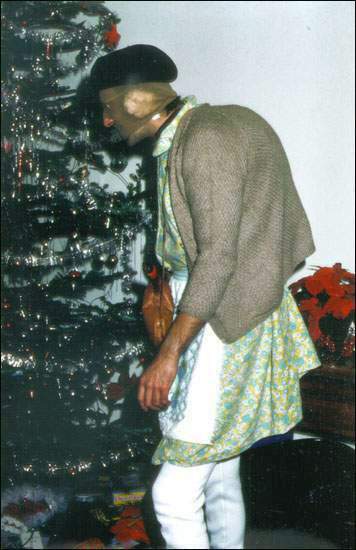 Mummering, the practice of disguising oneself and visiting from house to house, is carried on through the Christmas season. Known in Britain as "mumming," the name "mummering" long ago became usual in Newfoundland. It usually does not start until St Stephen's Day (known nowadays as Boxing Day, and falling on December 26th). Mummering is sometimes said to be a non-religious custom that should be carried on neither on Christmas Day itself, nor on Sundays during the season. Nonetheless, this is not a universal rule and one can find mummers out visiting even on Christmas Day (cf. Halpert and Story 1968). Mummering is a Newfoundland custom that takes place throughout the Christmas season. Reproduced by permission of Lara Maynard. Photo ©1975. In the 1960s it was common for people to say that mummering was dying out. Indeed they pointed at the widespread use of carpets as the reason mummers were no longer welcome -- it was more difficult to clean up the mud and snow from carpet than it was from linoleum. But in the 1980s there was a sharp increase in the practice of mummering and at the end of the 1990s it appears the custom is as strong as it ever may have been. Explanations of mummering have been many but the rule that the simplest explanation is the best suggests that theories of ancient rituals of sun worship, and devolution of mummers' play into the guising and visiting routine are probably wrong. The mummers' plays are traditional texts involving a short dramatic performance by six to twelve actors, playing the roles of King George, The Doctor, The Turkish Knight, and others. The traditional plays seem to have been no older than about 200 years and, in Newfoundland, were most popular in the second half on the nineteenth century. The traditions of guising and visiting, by contrast, seem to have been much older. One theory of the origin of the plays is that they were an effort by British lords of manors to contain and shorten the visits by peasantry. To some extent, this social role was carried over to Newfoundland by the encouragement of plays by school masters in some communities. For further discussion on mummering, see Widdowson 1984; Pocius 1988; Robertson 1984 and Lovelace 1985. Stag parties are a rite of initiation for men who by their upcoming wedding move from being single men, associating mainly with other single men, to being married men, with family responsibilities. The term is one from the 1950s and the custom of having such parties developed in that time. Nonetheless, such pre-nuptial parties are older than this century: men were known to raise a few glasses to toast the groom and his new bride in the last century and no doubt long before. Television, movies, and other mass media have influenced some of the expectations regarding the modern stag party. For example, thirty years ago cartoons frequently showed a group of drunken men around a package out of which was jumping a dancing, semi-clad woman. Although stag parties are known in Newfoundland, they are not as widespread as other wedding-related customs. "Stagette" and "bachelorette" are terms that came into being in the 1980s as a women's response to stag parties. They are a wilder form of the bridal shower, something a woman may have in addition to the shower. At the stagette, female friends of the bride will gather for a few drinks, sometimes relying on a bar-hop for the schedule: a visit for a single drink to each of as many bars as is possible. It might also include the appearance of professional male dancers (cf. Tye and Powers 1998). The bridal shower is much more genteel than the stagette. The latter normally includes fairly close friends, while the bridal shower usually includes a much a wider age range: three or four generations of women may attend. Like the stag party for men, the shower is a "certification" of transformation from single status to married status. Folklorists have pointed out that many of the games that are pastimes at bridal showers seem to mirror tasks that a traditional mother was expected to perform: for example, one traditional game is to see who can pick up with one hand the most clothespins. Birthday customs are as traditionally variable as calendar customs. Even though the term "bumps" is widely used, it does not refer to the same activity. In Newfoundland bumps usually refers to four people picking up the birthday child and bouncing their rump against the ground, once for each year and "one to grow on." In some other places bumps refers to the same number of kicks, slaps or "knees" in the thigh or buttocks. In a few parts of Newfoundland, the southwest coast and the west coast in particular, the traditional birthday trick is what is often known as "grease face." The same custom is known in parts of the Maritime provinces of Canada as "buttered noses" (cf. Hiscock 1991:24). As early as is convenient on the birthday someone tries to reach from behind the birthday boy or girl and dab on their nose a fingerful of grease, often butter. This is accompanied by best wishes for the year, now lubricated with the greasy face. Among schoolchildren this custom sometimes takes the form of pushing a sweet, creamy cake in the face. Until the past fifty years, almost all wakes were held in the person's home, usually in the best room of the house, often the "parlour" or "front room," a room rarely used for anything else (cf. Buckley and Cartwright 1983). Nowaday this tradition of sitting by a recently deceased loved-one and taking visitors, has mainly shifted to commercial funeral homes. Nonetheless, many of the cultural traditions have remained the same, that of sharing stories and food and of renewing friendships through the death of a common friend or relative, continue to the present. Traditions abound in Newfoundland about the different forms of funerals and wakes; it is often said that Irish-derived funerals are less formal than English-derived ones. Traditional prank stories tell of tricks played on grieving relatives by neighbours who make it appear that the corpse has sat up, or spoken (Narváez 1994). Perhaps the most controversial non-calendric custom in Newfoundland in recent years is the Screech-In. It is historically related to such traditions as equatorial line-crossing and initiation rites known all over the world. It derives from "honorary Newfoundlanders" rites of the 1940s and pranks played on new sealers going to the ice. The Screech-In came into being in the 1970s when Joe Murphy and Joan Morrissey put together an entertainment at the Bella Vista Country Club in St John's. It included local musical performers and a dress-up skit by which members of the audience were humorously "screeched-in." In later years the Screech-In was widely performed by Myrle Vokey and by employees of the Newfoundland Liquor Commission. Typically, initiates are made to kiss a codfish, drink some Screech (rum) and repeat a semi-dialect, slightly risqué recitation. In 1990 the custom came under fire from several directions and was attacked as a destructive mocking of Newfoundland culture. The Premier at the time, Clyde Wells, ordered the Liquor Commission to destroy "Order of Screechers" certificates that bore his official signature. Nonetheless, the Screech-In has continued in the 1990s as a widely favoured way of welcoming visitors to Newfoundland with an entertaining ritual.